NordFX Online trader's calculator is located in the tab «Tools» (https://nordfx.com/do/calculator) and will be of use both for beginners and experienced traders. You can instantly calculate the price of one point with its help, learn the size of a spread and a swap, as well as margin requirements for each type of account. 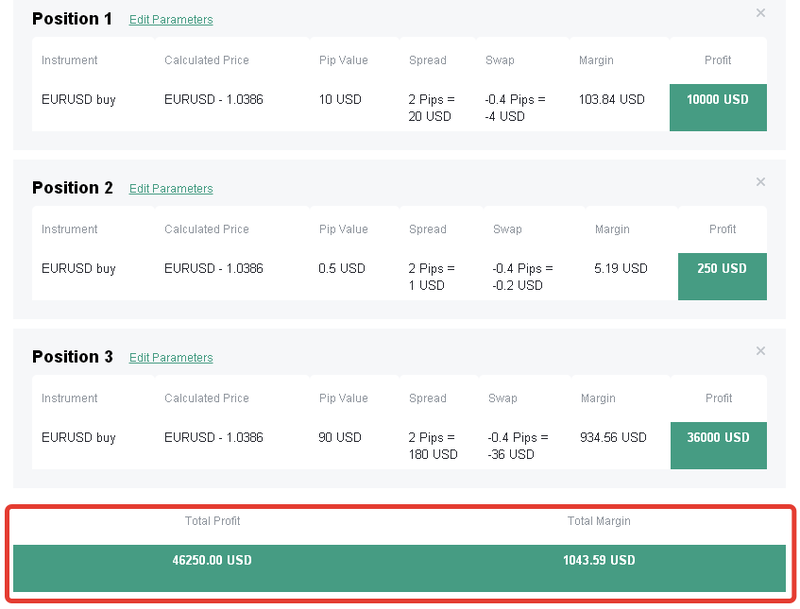 In just a few seconds, you can not only learn all the important parameters for trade, but also calculate the size of expected profit (or loss) for several positions at the same time. The risk of an error is reduced to zero, since all the account settings are already considered in the calculator. First, you choose the type of a trading account that you are working with. Recall that NordFX offers 5 main account types - Micro, 1: 1000, Standard, Standard-MT5 and MT-ECN as well as the Premium account. You can read their detailed description and benefits at the NordFX website in the relevant section (https://nordfx.com/accounts.html). Then in the window "Leverage" you choose the leverage you are currently using. 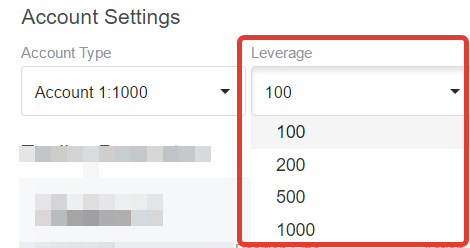 At the same time, clicking on this window, you can learn what leverage sizes are allowed on this or that trading account. For example, if only one leverage 1:100 is available at the }MT-ECN account, in the account 1: 1000 you can choose leverage 100, 200, 500 or even 1000, which will allow you to make transactions with a standard lot ($ 100,000), having in your deposit a little more than $ 100. The next window - "Currency" - is self-explanatory, there are only two options - Euros or US dollars. 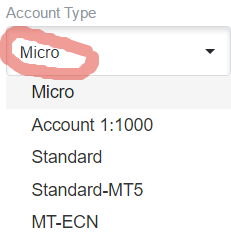 Now that you have specified the currency of your trading account, scroll down to the "Trade Options" window. You will not meet any difficulties here either. The first window is "Tools". Here choose the currency pair for which you are going to open a transaction or have already opened it. Just as in the case of leverage, the calculator will offer you only the options that are available for trading on this particular type of account. Opening price and estimated closing price, that is, the one for which you're going to close the deal, either manually or using Stop Loss or Take Profit, and lock in profits or losses. !!! Please note that in the window "opening price" the calculator displays the current quote for the selected currency pair by default. And what the profit will be if you have opened the transaction in the right direction, or the loss if you are wrong (alas, it happens too). If you decide to adjust some data, such as transaction volume, there is a data editor at your disposal (next to the position number). 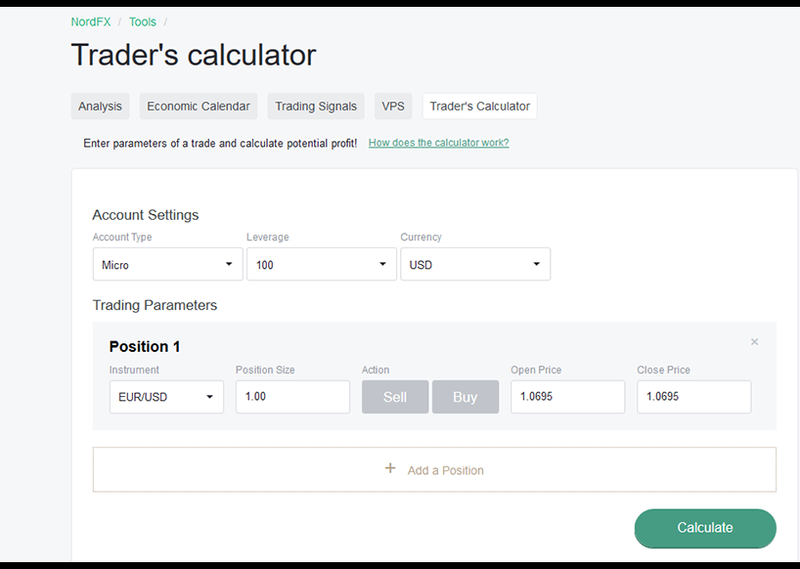 Another very handy feature of the Trader's Calculator is the possibility to add one more or several positions to the calculations. To do this, simply click on the "Add a position", and you will always know the total result of your trading for several transactions ("Total Income") as well as what free funds you need to obtain a predetermined gain ("Total Margin"). If you have any difficulties in working with the Trader's Calculator or other problems, you can contact the NordFX Support Service (http://nordfx.com/do/support/) or ask us a question in social media. We are always happy to help you!